We are pleased to announce our Washington, D.C. Journalism Job hosted by Georgetown University’s Master’s in Journalism Program was more successful than we envisioned. We’ve confirmed 3 job seekers were hired from the Job Fair and several others were called back for formal interviews. So many people attended the Job Fair, we ended up with $1,000.53 after paying all of our expenses. The presidents of the Washington, D.C. 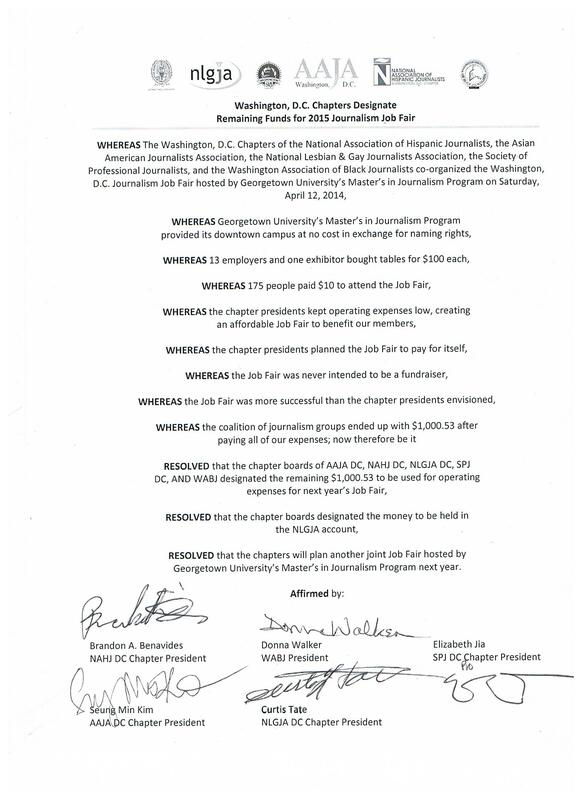 Chapters of the National Association of Hispanic Journalists, the Asian American Journalists Association, the National Lesbian & Gay Journalists Association, the Society of Professional Journalists and the Washington Association of Black Journalists signed the following joint-resolution.